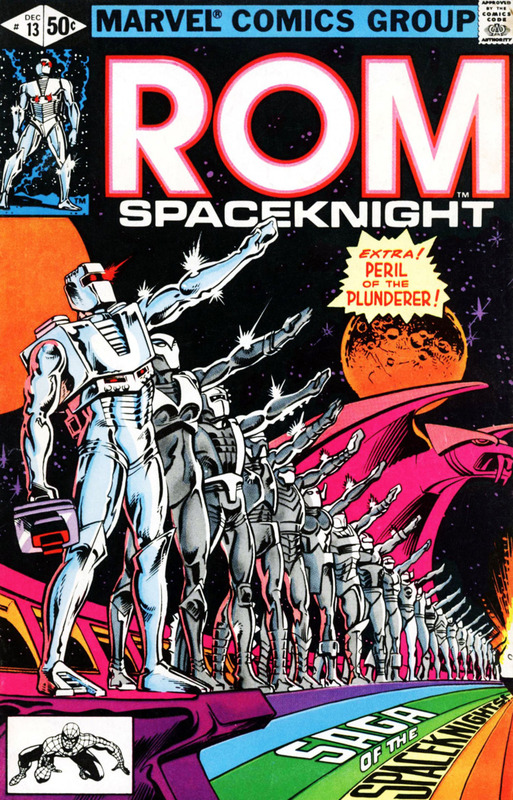 Rom is not doing too well. After the battle with Jack of Hearts last issue, he has crash landed on a beach with no memory of who he is or what has happened. A little girl named Talley comes upon him and instead of being scared because of his outlandish look, specifically because he is a cyborg, she is curious and wants to help him out. Hiding him in a cave so he will escape harm from those who might wish to do him so, Talley comes back later to see how he is when they hear noises outside. Out in the water are a group of pirates headed up by the Plunderer. As Talley runs off to get help, Rom follows the Plunderer back to his hideout and a battle ensues. Luckily, over the course of fight, Rom gets his memory back. As the battle rages though, the ship he and the Plunderer are on is damaged and crashes, possibly sinking them both to the bottom of the ocean. Here is another great issue by Bill Mantlo and Sal Buscema that finds our hero having to overcome another obstacle in his mission to rid the universe of the Dire Wraith threat. This time it just happens to be Rom’s own memory and the lack of it as well as the evil of man once again. Talley is a great character and it would be nice to see her pop us once again in the future if possible. The issue is very reminiscent of an episode of the Incredible Hulk television series, where Banner comes into town and touches the lives of the people he meets but has to move on and leave them behind. And just like the Hulk, Rom of course, does not get that happy ending. Also nice to see during the course of the book was that Rom’s argument of the Dire Wraith case might be gaining some traction as a photographer might have captured one of them on film. This was one of the better issues of late as it was a nice interlude in Rom’s mission, moving at times and still packed full of action.